I was invited by the author to be a member of the launch team for this book. When I got the email I was a quite ecstatic because I absolutely loved the first book in this series, A Light On The Hill. Connilyn is one of my favorite Christian authors! 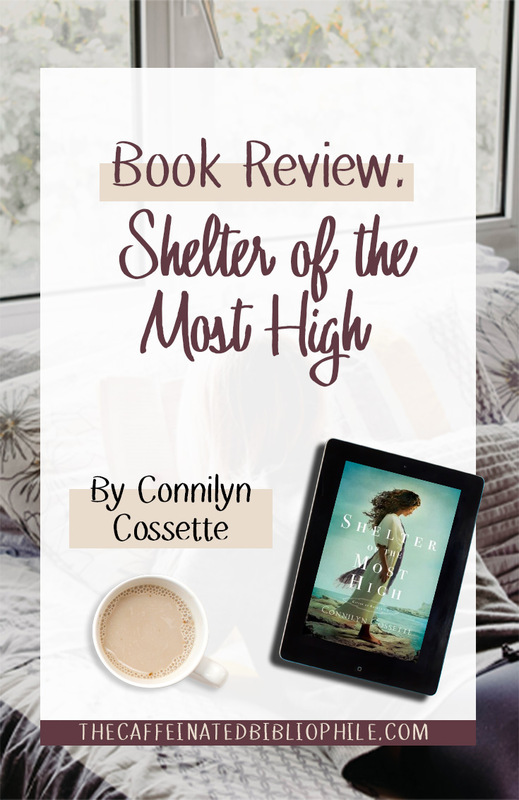 Shelter of the Most High takes place 11 years after the last book, A Light on the Hill. I do recommend that you read this series in order - as it does pick up on events from the first book. When I first started reading it was so heartwarming to read how Moriyah and Derek rebuilt their life in Kadesh. I just love a good reunion! Sofea and Prezi are swimming in the nearby caves when all of a sudden a pirate ship came to their shores and kills everyone in their village. They are the only two that are spared. After they board the ship, they shipwreck near the city of Tyre. Derek and his men find Prezi and Sofea half starved and lost on the beaches. Soon after they meet Moriyah and the family. We are also reintroduced to Eitan. If you read the previous book, Eitan is the boy Moriyah and Dererk adopted. He was 9 years old at the time. At first Sofea nor Prezi speak Hebrew and cannot understand a word they are saying. She believes that her and her cousin have been brought in as slaves. But soon finds out that Moriyah wants nothing of the sort and invites them to stay as long as needed. Prezi is absolutely devastated and refuses to get out of bed, traumatized by the events. I admired Sofea. She went through A LOT and lost everything but still went on with her daily life. I think she wanted to keep it together for Prezi because she was the only person she had left in her family. I really liked that Connilyn didn’t focus too much on the daily life, rather on what Sofea and the rest of the characters were thinking and feeling. I also appreciated that there is a 4 month time jump in the beginning after Sofea arrives in Kadesh because this helps the story progress. I also liked that she started the book off right with action- getting right to the story line! Connilyn has this talent of immersing you into the story so well that you can start to envision the setting in your mind. Connilyn also created a Pinterest board for the book- with inspirations of what the characters would look like, as well as the setting of the place. You can view it —-> HERE. I love it when authors do this because it helps enhance the story. And can I say Eitan is a very attractive man! Those two are just perfect for each other! They had such a similar background in life, so I think that helped them bond closer. And I loved that Sofea accepted him for who he was and not what he had done in the past. The one person that I really thought really made a huge change was Prezi. In the beginning she was with such despair but when she found her faith with God, she slowly made a change. She became bright and hopeful. Even though this wasn’t the main part of the story, I appreciated that Connilyn wrote this in. It reminds us of God’s grace and redemption. I really enjoyed the main mystery of this story. Even though we were not introduced to the murder plot later on in the story, I thought it was well written and executed. I was completely surprised and did not guess who was tied into the murder plot. Connilyn did not disappoint with her second novel in the series. Sometimes the second book in a series is not as strong as the first one, however, Connilyn kept it consistent and good as the first. This book had romance, drama, adventure, a murder plot, and so much more. I was staying up late at night just to finish this book - I couldn’t put it down! Yes! I will be talking about this book long after today. It was just absolutely stunning. It will be on my top favorites of this year for sure! I think anyone would just about love this book! If you haven’t already read any of Connilyn’s books you need to do so- ASAP! Have you read any of her books? If so share your thoughts in the comments! Note: I was sent a copy of this book to review by the publisher. All opinions are my own.